DEGREES THAT WAS SET IN 1984...1939 AND 1886. The Dulles and Baltimore/BWI records were 69°. 1 AM Update: And the 1 am temperature is again 70°, so the new record low maximum is pretty well set. Total area of District of Columbia: 68 sq. mi. Total area of Maryland: 12407 sq. mi. Total area of U.S.: 3,794,100 sq. mi. Midnight Update: The temperature has held at 70° for 5 out of the last 6 hours, so the final high is likely to remain at 71°, setting a new record for July 21. Although the 18 to 20 degree departures from average are spectacular, the same low clouds, drizzle, and light rain which depressed the daily highs have also kept the daily lows elevated, so the overall averages are in the -10° to -11° range relative to climatology. The daily average of 69° at Washington National, if it holds, will be the 3rd coldest July 21 since 1929, when the average was 68°. The average on this date in 1939 was 68.5°. The low in 1929 was accomplished the old-fashioned way, with a daily low of 58°. The record low for July 21 was 56° in 1909. The percentage of the U.S. affected by abnormally dry/drought conditions increased slightly in the past week to 81%, the highest since at least 2000. Meanwhile, the intensity of the drought increased as the severe and above category (D2-D4) jumped 5 percentage points to 42%, also a new 21st century high. 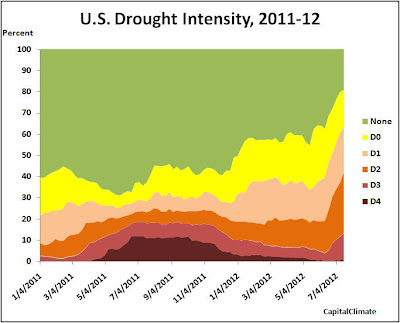 The 2 most intense categories (extreme and exceptional), however, are still well below their peaks of 2011. A strong upper-level ridge of high pressure dominated the nation’s weather this U.S. Drought Monitor (USDM) week, bringing well above-normal temperatures to the central and northern tier states. Clouds with scattered showers and thunderstorms along a stalled cool front kept temperatures below-normal in the southern states. But even then, maximum temperatures were 90 degrees F or warmer across much of the country, with maximums exceeding 100 from South Dakota to Kansas. Philip, South Dakota, reached 109 degrees on July 15. Beneficial rain fell from southern Texas to the southern Appalachians along the front. Excessive rainfall occurred over southeast Texas where amounts totaled 10 inches or more in places, but elsewhere rainfall amounts were generally localized with limited relief. Monsoon showers and thunderstorms brought above-normal rain to parts of the West, but the rain had little impact on deficits which have accumulated over several months. Weak fronts triggered localized showers and thunderstorms along the northern tier states. 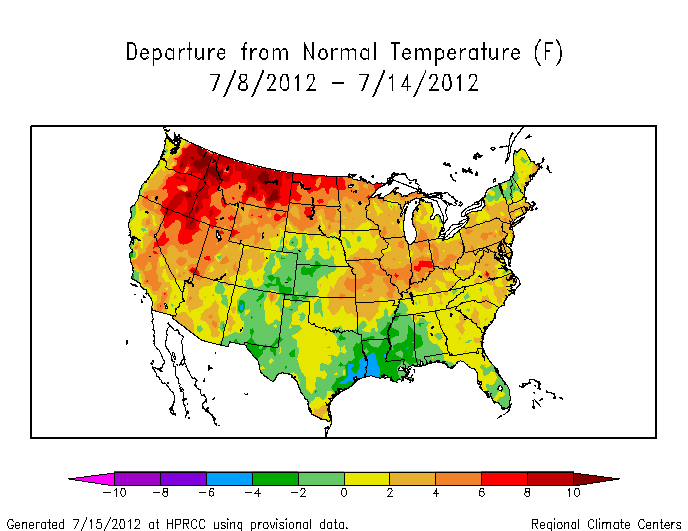 In between, hot and dry weather dominated from the central Plains to Ohio Valley, Great Lakes, and Northeast. Another week of hot and dry weather continued the deterioration of crop conditions in America’s breadbasket. U.S. Department of Agriculture (USDA) reports for the week ending July 15 indicated that 38 percent of the nation’s corn crop was in poor to very poor condition, compared to 30 percent a week ago, and 30 percent of soybeans were in poor to very poor condition (compared to 27 percent last week). Fifty-four percent of the nation’s pasture and rangeland was in poor to very poor condition, which is a jump of 4 percent compared to last week and is an all-time high for the 1995-2012 growing season weekly history. About two dozen large wildfires, mostly in the West, were burning on July 17, about half the number compared to a week ago. Streamflows were in the lower tenth percentile of record, or at record low values at several time scales, across much of the Midwest and parts of the central Plains, West, Southeast, and even parts of New England. As a result, the impacts boundaries were shifted to reflect short-term and long-term drought conditions from the west coast to Ohio Valley and Southeast, with short-term conditions indicated in the northern tier states and from eastern Tennessee to New England. Long-term impacts were indicated for parts of the Southwest and central Gulf of Mexico states. 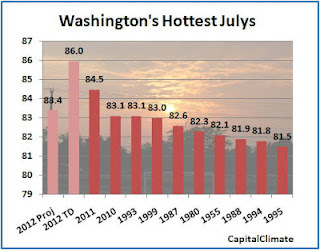 The high of 101° so far this afternoon at Washington ties July 1930 with the 6th 100°+ temperature for the month. It also puts this month firmly ahead of the pace of last July's all-time hottest month with an average of 86.0°, vs 84.5° in 2011. Even with a 20° cooldown to a forecast high of 81° on Saturday, a projection based on predictions through Tuesday the 24th and climatological averages for the remaining week of the month would put the July average at 83.4°, still ahead of the then record-tying July 2010. That would make the last 3 Julys the hottest on record. 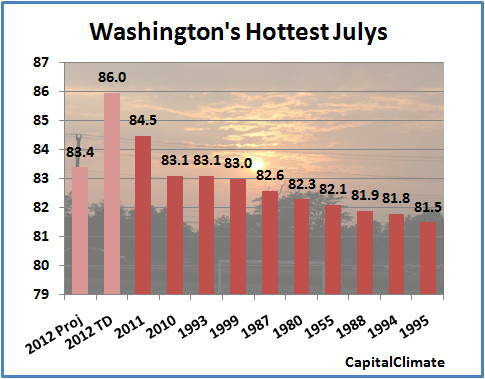 The only remaining top-10 hottest July before 1980 will be 1955. INCLUDING TODAY...THE HIGH TEMP HAS REACHED OR EXCEEDED 95F ON 18 DAYS AND 100F ON 7 DAYS SO FAR THIS YEAR...WHICH ARE BOTH THE MOST ON RECORD THROUGH 18 JUL AT DCA. PRIOR TO THIS YEAR...THE MOST 95-DEGREE AND 100-DEGREE DAYS THROUGH 18 JUL WAS 16 IN 1991 AND 5 IN 1988...RESPECTIVELY. THE MOST 95-DEGREE AND 100-DEGREE DAYS ON RECORD THAT OCCURRED IN A CALENDAR YEAR WAS 28 IN 1980 AND 11 IN 1930...RESPECTIVELY. CapitalClimate analysis of National Weather Service reports from 214 stations across the 48 contiguous states shows that the unadjusted US national average temperature was 2.9° above normal for the week ending yesterday, July 14. This was the 31st consecutive week and the 48th out of the last 52 with warmer than average temperatures. 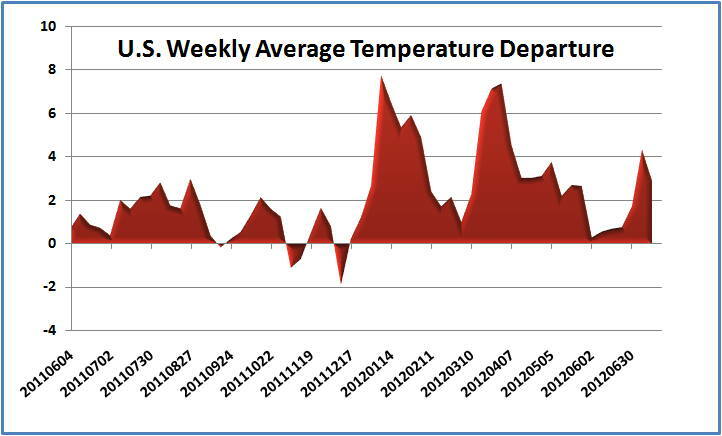 The last time there were 4 consecutive weeks cooler than average was in March 2011. After several weeks of persistently cool temperatures in the Pacific Northwest, the area of warmest temperatures relative to average shifted westward, while heavy rain produced cool temperatures along the western Gulf Coast. The warmest temperature departure was at Yakima, Washington, with +15°F, and the coolest was Beaumont, Texas, with -6°F. Overall, 82% of reporting locations were warmer than average.